People waved palm branches on that day, to symbolize that their Messiah had come. For this reason, we also bless palm branches at our Churches on this day. The Bishop or priest distributes them to all the faithful after the Divine Liturgy, to remember this very important feast day in the Church. On Palm Sunday night, we begin the services of the Bridegroom. We remember that the Church is the Bride of Christ. On all Bridegroom services, the faithful venerate the icon of the Bridegroom Christ. On Palm Sunday night and Holy Monday morning, we commemorate the memory of the righteous Joseph, who we find in the Old Testament (the entire story is found in Genesis 37-50). The story of Joseph shows us that if we believe in God, He will save us and that we should forgive people that might not like us; Joseph did it, so did Jesus and countless others. We also remember our Lord’s words in the Gospel, specifically the “cursing of the fig tree”. This story tells us that the fig tree had leaves on it but no fruit...it was alive, looked good and proper, but bore no fruit. Are we like this, only leaves but no fruit? We must always ask ourselves this question to progress in our spiritual lives. Jesus always liked to talk in Parables. These parables are stories where people can understand a bigger meaning in a shorter story. On Holy Monday night, we remember the Parable of the 10 Virgins. Jesus shows us with this parable that we must always be ready for His Coming, because we might miss the entrance to Paradise. He relates Paradise to a “bridal chamber”: in other words, a wedding. There are many people that are invited to this wedding: we are all invited with our baptism, and continue to be invited throughout our lives. Yet, it is our choice to accept this invitation. God wants us all to be members of His Kingdom, and we pray that we can be always ready. We should always remember that entering Paradise is a gift from God, and it is not a right. ; consequently, we should thank God for this blessing. Your bridal chamber, O my Saviour, I see all adorned, but I have no garment so that I may enter it. Make bright the mantle of my soul, O Giver of light, and save me! 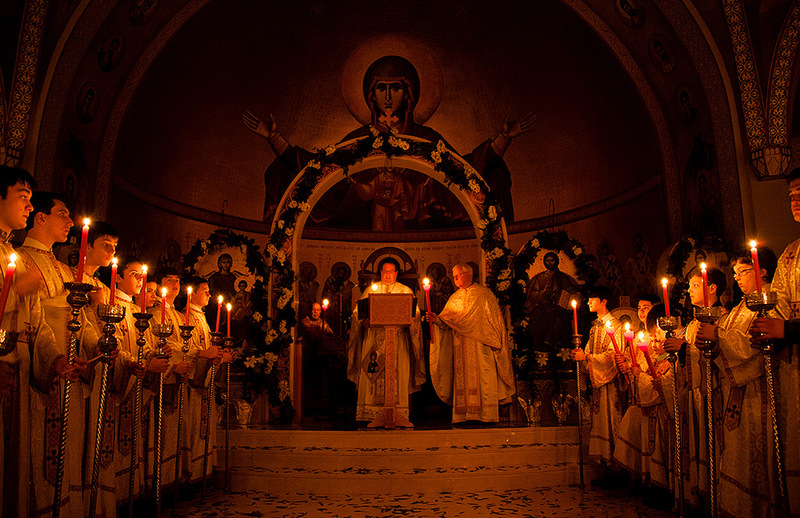 On Holy Tuesday night (the Matins of Holy Wednesday), the famous “Hymn of Kassiani” is chanted. This hymn stems back to the 9th century, and is one of the most beautiful hymns of the year. It is deep in theological meaning, showing repentance for sins and a pledge to be together with God from this time forth. Yet, there is some confusion as to the people described in this hymn. The author of this magnificent hymn is St. Kassiani the Nun. While she wrote about 50 hymns (30 of which we still use today), she founded a monastery in Constantinople in 843 and became its first abbess. While St. Kassiani is the author, some people ask who the sinful woman is. The answer is simple: We do not know who she was. We only know of the great act she did. She humbled herself in front of the Savior and begged for forgiveness. She changed her ways so that she can have eternal life. May we follow in her footsteps and repent of our sins with humility. The Washing of the Feet: Before supper, it was customary for the host of the dinner to wash the feet of his guests; this is what Jesus did. He showed His humility, and showed us that we must be humble if we want to be like Him. The Mystical Supper: This is when Jesus gave to His disciples His life-saving Body and Blood. He said to them, “Take, eat, this is My Body...Drink of it all of you, this is My Blood… Do this in remembrance of Me.” Jesus shows us that we should go for Holy Communion as often as possible. The Prayer at Gethsemane: Jesus prayed for His disciples and the entire world, in the so-called Αρχιερατική Προσευχή (the “Hierarchical Prayer”). Jesus shows us that we should always be vigilant when it comes to our spiritual life. The Betrayal: Jesus is betrayed by Judas to the Jewish authorities, and the sad events of the week begin. This Vesperal Liturgy of St. Basil the Great is done on Holy Thursday morning, in anticipation of the events of the evening (i.e. the mocking, crucifixion and death of Jesus Christ.) Some of the same hymns are chanted, as we chanted for the Matins service. People commune the Body and Blood of Christ at the time we always do; after the Liturgy, the Priest does not commune anyone until Holy Saturday morning. During this Liturgy, we find the Priest consecrates a second “Lamb” (that is, the piece of bread that becomes the Body of Christ during the Divine Liturgy). The Body of Christ is then immersed into the Blood of Christ in the Chalice. It is then placed in the Tabernacle. The amazing miracle that happens is that the Holy Communion does not “ruin” after being in the Tabernacle for an entire year. Each year, a new piece is put in for emergency cases. The service on Holy Thursday night is one of the longest services of the year. The Holy Service of the Passion is a service filled with beautiful hymnography and 12 Gospels that depict the various events of the Passion of Jesus Christ. Various hymns are chanted by the people, and Gospels are read that describe Jesus’ betrayal, His trial by the Chief Priests and Pilate, and then His Crucifixion. Today he who hung the earth upon the waters is hung upon a Tree. He who is King of the Angels is arrayed in a crown of thorns. He who wraps the heaven in clouds is wrapped in mocking purple. He who freed Adam in the Jordan receives a blow on the face. The Bridegroom of the Church is transfixed with nails. The Son of the Virgin is pierced by a lance. We worship your Sufferings, O Christ. Show us also your glorious Resurrection. Following the Procession, people come up and venerate the Crucified Christ. In the Orthodox Church, we have a certain part of worship that is called “The Liturgy of the Hours.” They are chanted every single day, usually by members of the monastic community. On Holy Friday, though, we have all Churches chanting the service of the Royal Hours. They are called “Royal Hours”, because they are different from the regular service of the Hours (in that, they remember what happened, hour by hour, to Jesus Christ during His Passion). This service is usually done every Holy Friday morning, or Holy Friday afternoon right before Vespers. On Holy Friday afternoon, we gather in Church for the Vespers called The Service of the Descent from the Cross. During this service, various hymns are chanted about Jesus’ death. Various Bible readings are read, which discuss the suffering and death of Jesus. Towards the conclusion of the Gospel reading, the Bishop or Priest, acting as Joseph of Arimathea, takes down the Body of Christ off the Cross. After this, the Bishop or Priest takes out the Shroud (an icon depicting Jesus being taken down off the Cross) and put it into the grave of Christ (which is decorated with various flowers). After the service is over, the people will come and venerate the Shroud. The Matins of Holy Saturday is the first significant change to the mood of the week. Until now, we have seen the overall mood being that of “sorrow”; with tonight’s service, however, we start to see the mood change to that of “joyful anticipation.” This Saturday is called the “most-blessed Sabbath,” because “He will rise again on the third day” (Kontakion of Holy Saturday).At the singing of the Great Doxology, the Holy Shroud is processed around the church. At the Alleluia verses, the reader chants the verse " Let God Arise, Let his Enemies be Scattered, Let those who hate Him flee from before His face". Holy Saturday morning is the last day of the fast for Holy Week. It is a day of joyous anticipation, but also one of reflection, prayer, and preparation for the great feast of our Lord and Savior Jesus Christ. We commemorate our Lord’s descent into Hades and prepare to celebrate His Resurrection; we can see this in the hymns that are chanted, expressing the “groaning of Hades” and rejoicing of the Heavens. The service that is done this morning is the Vesperal Divine Liturgy of St. Basil the Great. The service begins as a regular Vespers. At the Entrance for the “Thanksgiving of the Lighting of the Lamps”, we are told to read 15 prophecies to do with the Resurrection. After the Epistle, the Priest and the people chant the hymn, “Arise O God, judge the earth! For You shall have an inheritance among the nations!”. The Gospel recalls the events of the Resurrection of our Lord, and the Liturgy takes place.In the past, this was a special day for the catechumens of the Church. Catechumens were people that were learning about the Faith, but were not baptized Christians. On Holy Saturday, catechumens would be baptized by the Bishop of the diocese. That is why the Resurrection of Christ is not just the general defeat of death and the Devil by Jesus Christ, bringing everyone once again to their original home (which is Paradise), but it is also something very personal. It was the day that each Christian remembered their acceptance of Christ’s wonderful gift, which is called the Kingdom of God. This feast is the most important in the entire Church calendar. We remember that it is this day that our Lord and Savior Jesus Christ brought us “from death to life and from the earth to Heaven” (1st Katavasia of Easter). His conquering death and the Devil gives all of humanity the chance to become citizens of His eternal Kingdom. We rejoice in the Resurrection, and always remember the love of God present in our lives on this feast day. At 11:30, the Nocturn service begins. The Choir sings the Canon, and at the Ninth Ode, "Do Not Lament Me O Mother", the Priest censes the shroud three times, and at the point in the ode, "For I Shall Arise", the Holy Shroud is processed to the altar where it will remain until Holy Ascension. At this point the nocturns ends, and the entire church is in darkness. At the immediate 12:00, the clergy in the altar begin the song, "Thy Ressurection", and at the Third time, all exit the altar and light the people's candles. The clergy exit the church and process three times. At the end of the third, all gather at the closed doors of the church, where "Christ is Risen" is sung for the first time by the priest. All in the church enter and the matins of Pascha is sung. Everything is bright, and the Canons reflect the Bright Ressurection of Christ.